Home Beers Cellarmaker Brewing Co.
Mt. Nelson | Cellarmaker Brewing Co. Hopped With 100% Nelson Sauvin Hops. As You Contemplate The Path To The Top Of Mt. Nelson Think About The 2.5 Lbs. Per Barrel Of New Zealand Nelson Sauvin Hops In This Precarious Pale Ale. Ruminate On The Diesely, Tropical Fruit And Melon Aromas. May We Suggest A Word Of Advice: It’s Not The Summit Of Mt. Nelson You Need To Worry About, Rather, The Way Down To The Bottom. The beer is a darkened yellow. Very cloudy. Smallish head, kinda soapy. The aroma is full of hops, tropical and fruity. Lemon, pineapple, grape, big floral note, some pine. Wonderful mineral flavor in the taste. Just full of hop flavor. Moderate to light bitterness. Juicy and excellent. Really nice feel. Smooth with nice body from the minerality. Two-day old growler into a tulip glass. Pours hazy gold yellow with a finger of medium density white head that left thin ringed lacing. Nose is very pleasurable, very tropical with subtle grassy/earthy undertones. Taste follows the nose extremely well. Finish lingers ever so slightly with some astringency. Mouthfeel is nice, incredibly drinkable, carbonation medium-to-high leading to a bit of spritzy/tingly feeling, plenty of astringency and a bit of bitterness. Very enjoyable beer, will definitely get again whenever given the opportunity! 650 mL bottle. Very hazy yellow. Smells of tropical hops with some floral notes. Light herbal and pine bite behind it. Tastes very bright and juicy. Strong garlicky bite behind it. None of the herbal notes. Light cracker malt and a strong bitterness. Lingering sweetness. Very light body. Aggressive hop profile. I like it. Lots of Nelson hops on this bad boy give it a nice grassy aroma, but for me there's an underlying toasty note on the malt that stands out. Balanced and restrained. Tasty. Poured from a 22 ounce bottle into an Ommegang tasting glass. Bottled 5 April 2016. Thanks to my good buddy RZ. S: This smells like divine nectar. In the garden of the gods, this is their honeysuckle. Weirdly distinct papaya, blood orange, heady floral scents, a touch more lemondroppy citrus, and perhaps something else tropical. T/M: Cellarmaker makes my favourite pale ales, and Nelson Sauvin is my favourite hop. There may have been some way for this to go wrong, but it didn't. It's damn near perfect. A tad resinous perhaps, probably due to the boatloads of hops involved, that intrudes on the flowery quality I was so enjoying in the nose. Perhaps sharper and less fruity than I expected, but if you look anywhere but at the core of the flavor, it's dripping with tropicality-- strange limesickles, funny bushes (verbena? ), candied pineapple. The flavor is sadly a tad brief, but on the flipside, this means it's crisp and even refreshing. O: Call me biased. Go ahead. I'll be drinking this godsend while you gab. Pours a hazy straw gold with a white head. Aroma is all Nelson. Taste follows nose with white grape, grapefruit and lemon. An excellent showcase of the Nelson Sauvin hop. Mt. 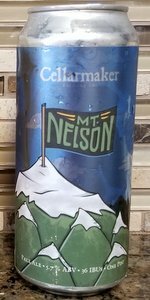 Nelson from Cellarmaker Brewing Co.